Similar to Bus except all machines accept all packets and pass on any that are not theirs. 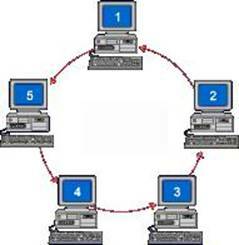 Token Ring (developed by IBM) uses copper and fibre-optic cabling, operates at 4Mbps to 16Mbps, and supports 255 nodes. This network is reliable but is difficult to troubleshoot.